When the sun sets in the Bay Area in October, you may notice large hairy spiders emerging from their homes for their once-in-a-lifetime quest. 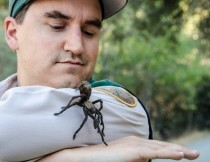 After 5 to 8 years spent in a solitary, nocturnal life -- largely in a burrow subsisting on insects, frogs and perhaps even snakes or mice -- the male California tarantula is mature and ready to find a mate. Roaming at dusk and after dark, sometimes in large numbers, the males go in search of a willing female. They hunt to find her silk-lined burrow marked with a scent indicating she’s looking for a mate. To prevent being accidentally trapped for a future meal, he uses his front legs to drum on her doorstep. There is a good video from the San Diego Zoo showing this whole courtship and mating ritual with the California tarantula’s cousin, the even larger Goliath tarantula. Within about 6 months after mating, male tarantulas die. The females live for another 25-or more years; they're built to last! Male spiders are most often seen on trails, roads and gardens with occasional appearances in residential homes and garages this time of year. When I began my career as a naturalist at Black Diamond Mines, I often encountered them in the parking lot as I left work in September and October. For those with arachnophobia, it can seem like some kind of autumnal plague. In reality, though, these spiders are gentle giants, especially as procreation is foremost on their minds. Tarantulas have a couple of defensive behaviors as they are sometimes considered food items by other animals. They defend themselves by rubbing or flicking irritating hairs off of their abdomen with their hind legs. If these get into any animals' eyes, noses or mouths, it will be enough to dissuade them from eating the spider and can even cause blindness. Tarantulas also have large fangs with venom. Their bite hurts like a honeybee sting and some people experience a similar allergic reaction to it. Scientists are exploring uses for tarantula venom. There are apparently hold potential for treatments for Multiple Sclerosis and breast cancer. As Aldo Leopold so astutely put it, “…who but a fool would discard seemingly useless parts? To keep every cog and wheel is the first precaution of intelligent tinkering.” Keeping a healthy, wild population of huge spiders might just benefit us in the end. You can catch the hairy spider show any evening this fall. Areas within various East Bay Regional Parks from the Delta, south through Mt. Diablo and Sunol-Ohlone Wilderness have their fair share of them. In the Oakland hills, you’re more likely to see a different spider species, the false tarantula, which looks similar. 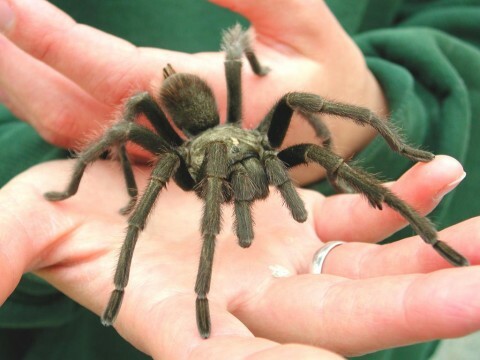 If you encounter any of these tarantulas during your travels, remember that they're just trying to carry out their spider business -- they're not out to get you! Give them a helping hand and let them carry on.